EZ Bar Vs. Barbell: Which Is Better? EZ bars can be considered to be a variation of the ordinary barbells with the bars twisted, bent and curved in order to provide more support to the palms. When in a curling position, the curviness of the EZ curl bar ensures that the palms are in their natural position rather than being upward as is the case with typical barbells. They are normally used by bodybuilders for bicep exercises which involve curling as such exercises are not as painful with EZ bars as they are with typical barbells. When it comes to using EZ bars for exercising, most bodybuilders like to know “how much does an EZ bar weigh?” and “how much does a curl bar weigh?” Let’s find out! The standard EZ bar is lesser in weight as compared to the typical barbell. So, how much does an EZ bar weigh? Well, the standard EZ bar weighs around 10 pounds while the straight barbell weighs around 15 pounds. 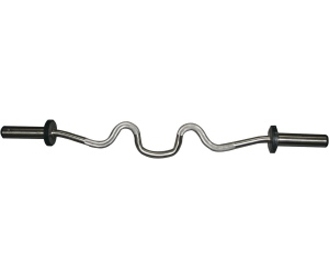 Olympic EZ Curl bar or revolving curl bar weighs more than a standard curl bar. So, how much does an EZ curl bar weigh (Olympic)? It weighs around 25 pounds. This is because they are longer and have a sleeve and a bearing assembly. Still, they aren’t as heavy as a typical Olympic barbell which weighs between 35 to 45 pounds. You don’t need to spend a lot of money into buying Olympic EZ curl bar unless you want to curl weight of more than 100 pounds. Hold the EZ Curl bar in such a manner that your palms are in a forward facing position. Your palms would get tilted in an inward manner due to the bar’s curvy shape. Maintain a standing position that keeps your torso upright. Keep your elbows close to your torso. Keep your upper arms totally still and then use your biceps in order to curl the weights. Once the bar reaches shoulder level, try to keep the bar in the same position for a couple of seconds and then move it horizontally in order to squeeze your biceps. Gradually start to move the bar into its start position. Do the exercise in sets as recommended. There is another possible way of performing the movement in which you can get a great contraction at the top. To do this, you should hook the EZ attachment with a low pulley. To bring in more variety, you can widen your grip too. Lie on your back on a flat bench and keep the EZ bar which has been loaded to your desired weight over your torso. Form a narrow grip on the handle of the EZ bar and lift it above your torso while keeping your elbows in line with your body frame such that your arms form a 90-degree angle with the bench. Gradually bring the bar down from your torso to the lower part of your chest. Make sure that your elbows are tucked in while doing this. Make use of your triceps to move the bar back to its starting position while you breathe out. EZ bars are different from the straight barbells as they have a curvy or bent appearance. Their weight is lesser too as you already know "how much does an EZ bar weigh" now. The result of the curvy handle is that when you hold the bar in your hand, the palms are positioned more naturally for curling exercises. This results in lesser pain in the elbows and wrists during curling exercises. There is a catch with EZ bars though. 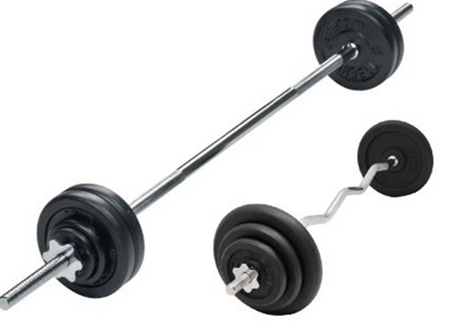 When you would do curling exercises with the straight barbell, all the flexing would be done with your biceps. However, in the case of an EZ bar, the flexing would also move into your forearms thereby decreasing the amount of flexing of the biceps. You can try this yourself even without either of the bars. Simply make a fist with your palm looking upward. Now position your arm just like you would do when you would start a curling exercise (your elbow will be bent at 90 degrees). Your bicep would perform the flexing entirely. To model curling exercise with an EZ bar, make a fist with an inwardly rotated palm at 45 degrees. This time the flexing of the bicep would noticeably reduce. To sum it all up, if you don’t feel any pain in your elbows or wrist while performing curling exercises with the normal barbell then continue using it. In case you do experience some pain then you shouldn’t hesitate in switching to EZ bars. A type of EZ Curl bar is the Super EZ Curl bar. They are pretty similar to the normal curl bar but their curves are acuter. These bars best serve people who try the hammer curls as you can hold the bar in a parallel grip. 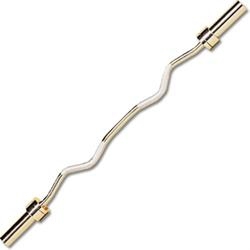 While it would be great to have the super EZ curl bar too, it’s better to buy the traditional curl bar in case you don’t have any type of curl bar.